Our Annual Chinese New Year Dinner to celebrate the arrival of the year of the Horse with more than twenty five other community organisations was held on Saturday 1 February 2014. It was once again held at Marigold Restaurant in Chinatown. The evening’s programme started with our traditional lion dance followed by a sumptuous dinner. After an address given by our President Mr Samuel Chu we had a number of VIP speakers. From the Federal Parliament we had The Hon Philip Ruddock representing the Prime Minister, the Hon Tony Abbott and and The Hon Matt Thistlewaite, representing the Federal Leader of the Opposition, the Hon Bill Shorten. From NSW Parliament we had The Hon Gladys Berejiklian, Minister for Transport, representing the Premier, the Hon Barry O’Farrell and Mr John Robertson, NSW Opposition Leader. From the Chinese Consulate we had the Deputy Consul General Mr Tong Xuejun. We are grateful to all our VIP speakers for their attendance and their congratulatory speeches to help us celebrate Chinese New Year in Sydney. In addition to the above speeches we also played a special Chinese New Year congratulatory message from the Prime Minister, the Hon Tony Abbott. Apart from celebrating Chinese New Year we also raised funds for Child Fund Australia. 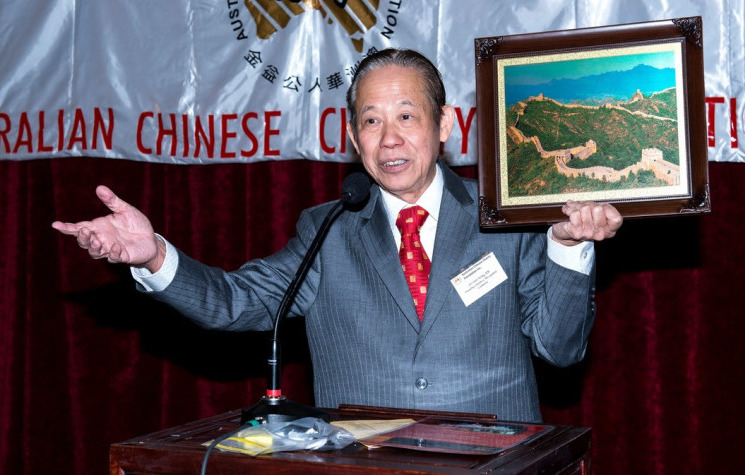 All proceeds from auction ($17,500) conducted by Dr Peter Wong, our Founding Chairman and donations ($5,200) went to Child Fund Australia. Child Fund Australia has active relief projects in South East Asia and in particular in the Philippines helping children who have lost their parents during natural disasters in recent years. A cheque of $22,700 was presented to Child Fund Australia at the conclusion of the auction. Michiko Formula Aust Pty Ltd made a special cheque presentation to Sydney Medical School’s Chronic Illness Peer Support Program at Westmead Children’s Hospital. We like to welcome our new event sponsor Michiko Formula Aust Pty Ltd and we wish to thank PWC, InvoCare and NAB Private Wealth for their continuing support and participation. The success of any event depends on good teamwork of volunteers. We like to thank our very hard working dinner sub-committee and other volunteers especially Mrs Monica Chu for preparing the program, Mr Victor Yeung for being the MC, Mr Victor Tsang for managing the floor and Mr Kevin Cheung and Mrs Agnes Man for controlling the treasury. We also like to thank all those who have donated table prizes, raffle prizes and auction prizes and those who bid at the auction. We look forward to their continuing support for ACCF at our future fund raising activities.